Hazardous Waste & Paper Shredding Day a Success! Clifton Park NY - The town of Clifton Park held its 17th annual Hazardous Waste Day in September 2010 and a Paper Shredding Day in October 2010. The results of each day have been tallied and the numbers are huge! Clifton Park residents showed a big response and made these opportunities a great success! Almost 1,000 Clifton Park Residents participated in the recycling of appliances and hazardous waste. 100,000 pounds of electronics and 24,000 pounds of hazardous waste, including paints, batteries, propane tanks and other chemical items were disposed of. Getting rid of such items on designated days is a free and easy way to ensure that such items will be disposed of properly! 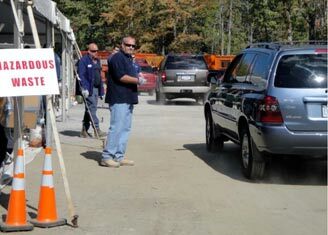 Paper Shredding Day offered residents the chance to get rid of bulk, sensitive documents and other paper products. The shredded paper was then recycled and sold to a local paper company. In order to participate residents were asked to bring a canned good to be donated to the local food pantry. Residents brought in nearly 600 pounds of food to be donated! The town offered great opportunities to its residents and they took full advantage! In just two events residents took part in: recycling, donating to a good cause, volunteering, taking a step toward protecting their privacy and getting rid of hazardous waste responsibly. Congratulations to Clifton Park, both the town and its residents!